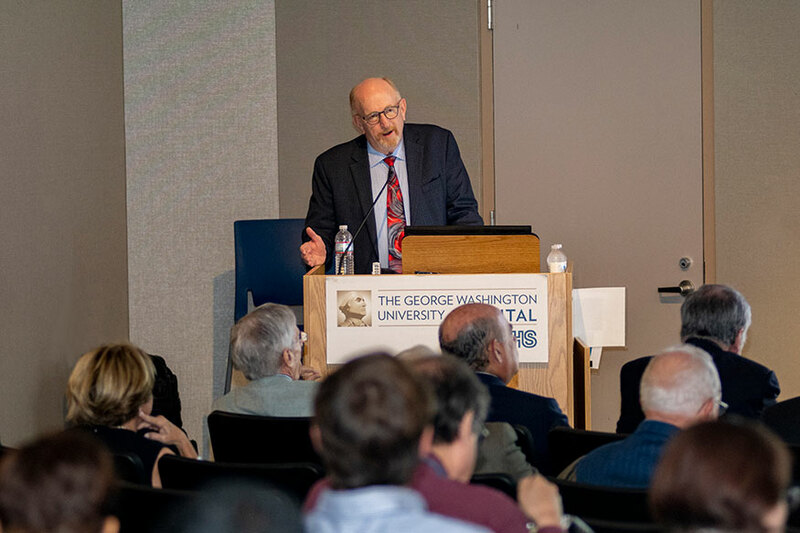 Kassan endowed the lecture series to grow rheumatology research at GW through academic collaborations between GW faculty and experts in the field. For more than 30 years, Kassan has supported GW in myriad ways. He served on the GW Board of Trustees for eight years, completing his term in May 2018. He also was a founding member of the GW Medical Alumni Association, and supported the creation of the GW Clinical Learning and Simulation Skills Center. At the start of the first lecture in the new series, Victoria K. Shanmugam, MD, director of the Division of Rheumatology and associate professor of medicine at SMHS, thanked Kassan for his continued support of his alma mater. Kassan, who currently serves as a distinguished clinical professor at the University of Colorado School of Medicine, sat in the front row of the GW Hospital auditorium with his wife, Gail, by his side to listen to the talk. The inaugural lecturer, V. Michael Holers, MD, Scoville Professor of Rheumatology and head of the Division of Rheumatology in the Departments of Medicine and Immunology at the University of Colorado School of Medicine, is no stranger to Kassan’s generosity. Holers’ address, “Genetics and the Environment in Rheumatoid Arthritis,” focused on the past and future of the disease. “I think there are huge opportunities in rheumatology, in research, and in prevention, and … where things are going,” Holers said. He spoke about the rise of immunology in the field, and said the “real success” of his generation’s work on rheumatoid arthritis (RA) has been figuring out which immune factors are important in the actual disease. Hollers added that RA, more than any other autoimmune disease, has befitted from the use and development of targeted therapies. “We’ve also had recent success with signaling inhibitors. So RA has been at the forefront of biological therapies that have impacted many areas of medicine,” he said. Through those advancements, approaches toward RA have greatly changed, but there’s still progress to be made, Holers said. Despite improvements in therapy, he said, less than 50 percent of patients who achieve remission with early treatment still have that status after a year. “So in this morass of immune system reactivity, we still don’t have the golden hit, the golden target. And when you start to mix and match these biologics with each other, the side effect rates become unacceptable,” he said. He added that knowledge about the disease has greatly increased, aiding in continued work to understand RA better. That includes diagnosing the disease earlier, as well as learning about environmental risk factors that can create an increased or decreased risk for RA, such as smoking as a behavior that increases risk and eating fatty fish as a factor that decreases risk. “But now the question is: How does this disease develop? Are there ways we can figure out how to prevent this disease from developing? And that is the future and the challenge,” he said. Studies, including those at the University of Colorado School of Medicine, explore the link between genes and environment and systematic autoimmunity, alongside other factors, to discern what happens to people in the pre-clinical time period. “We needed to study individuals in real-time who are at future risk for RA or had autoimmunity or had family risk. And what were our goals? Our goals were everything you would want to know: what their exposures are, what their antibodies are, what their genetics are,” he said. By improving the identification process for those at great risk for RA in the pre-clinical period, he concluded, patients’ lifestyles could be modified and major comorbidities could even be mitigated.